My fourth of five RW dinners was last night at dante in the Royal Sonesta Hotel in Cambridge. 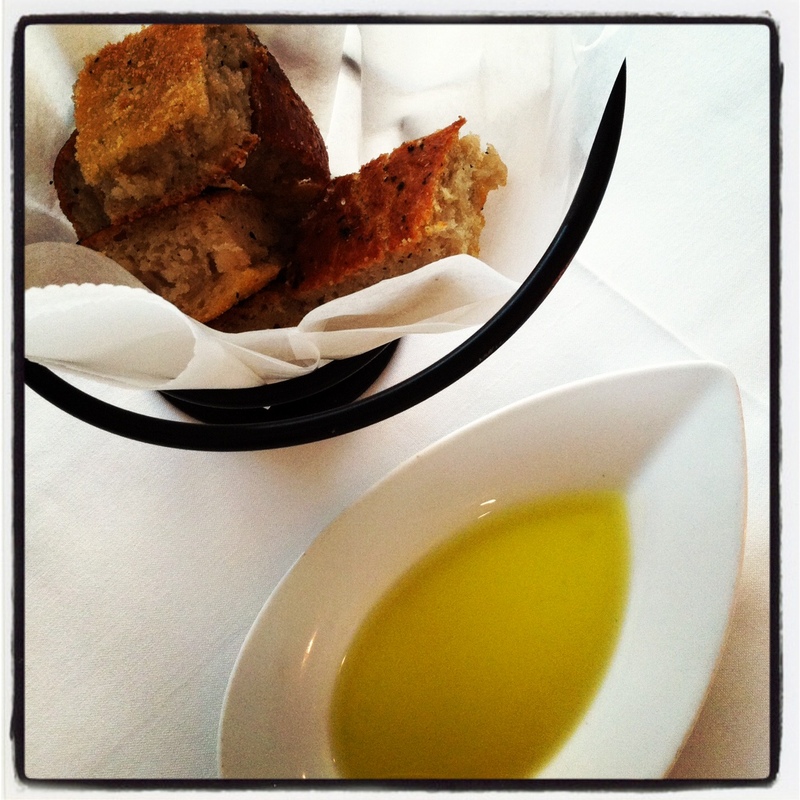 Bread: A small metal bowl came with 6 slices of white bread and a bottle of EVOO. 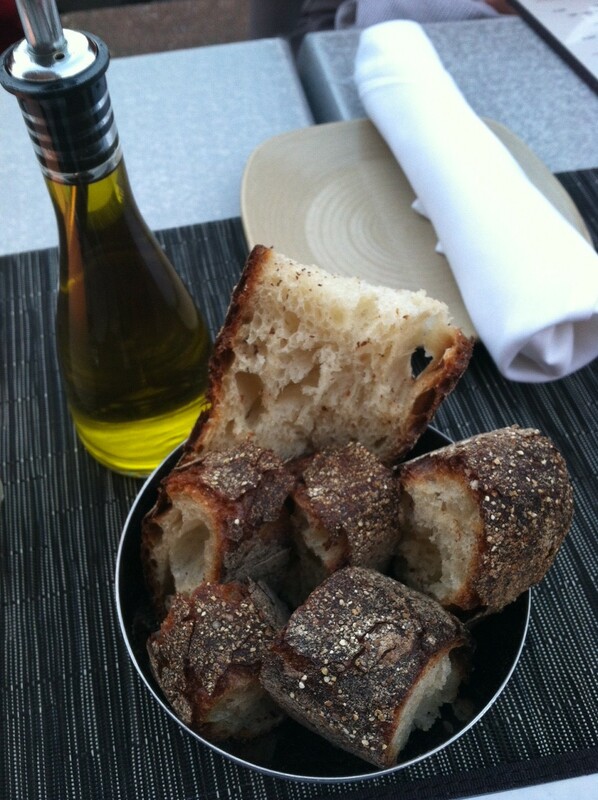 The bread itself was pretty good but a few pieces were a bit too airy and I didn’t love the crust. 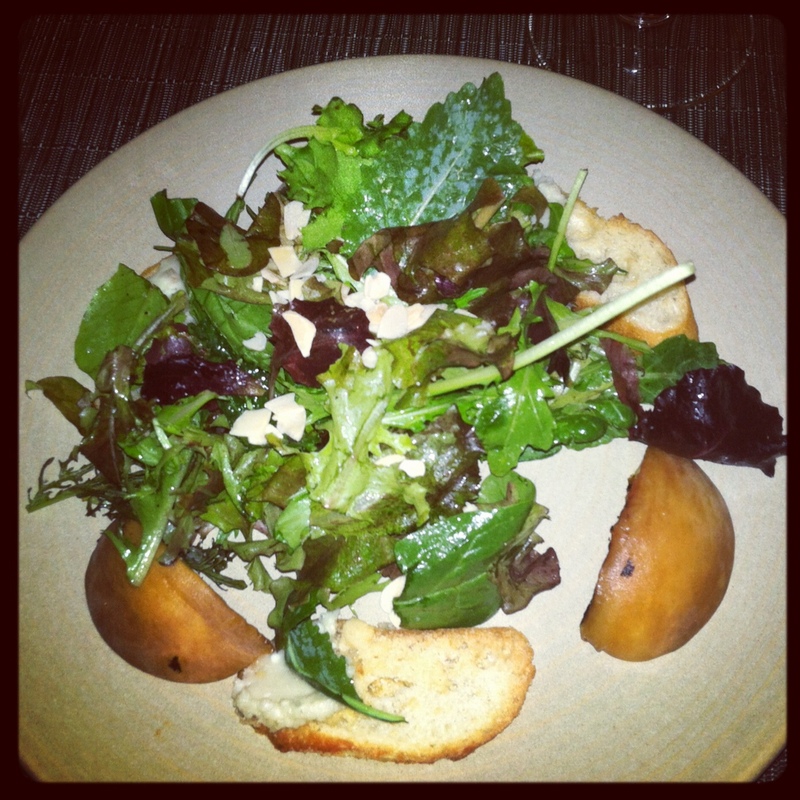 This salad came topped with shaved almonds, peach chunks on the side along with 2 crostini with a smear of gorgonzola cheese. The lettuce was barely dressed and I wish the cheese was actually crumbled over the salad. The peaches were also not grilled as much as I had hoped. Not a terrible salad, but definitely a bit disappointing. 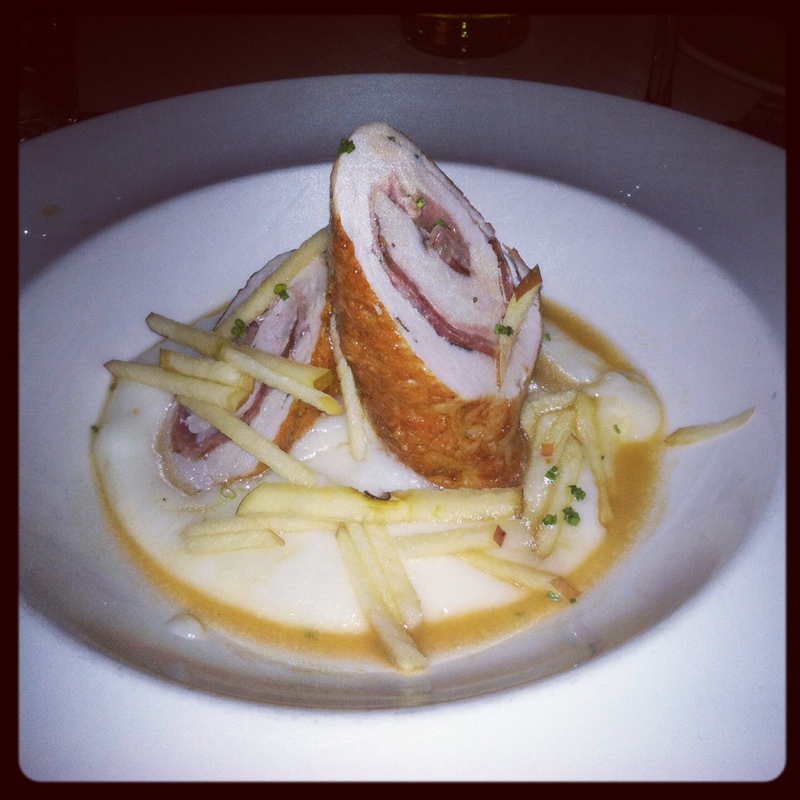 The pork came rolled and stuffed with prosciutto in a bed of polenta and topped with apple slices. When I think of prosciutto I imagine thinly sliced and slightly salty meat. Whatever was curled up in the pork loin tasted more like overly salted ham, which I dislike. I ate most of it but eventually picked out and discarded the “prosciutto” pieces. The apples were a nice touch but the polenta wasn’t up to par with others I’ve had recently (see Henrietta’s Table). While I do enjoy creamy polenta this lacked flavor and texture. 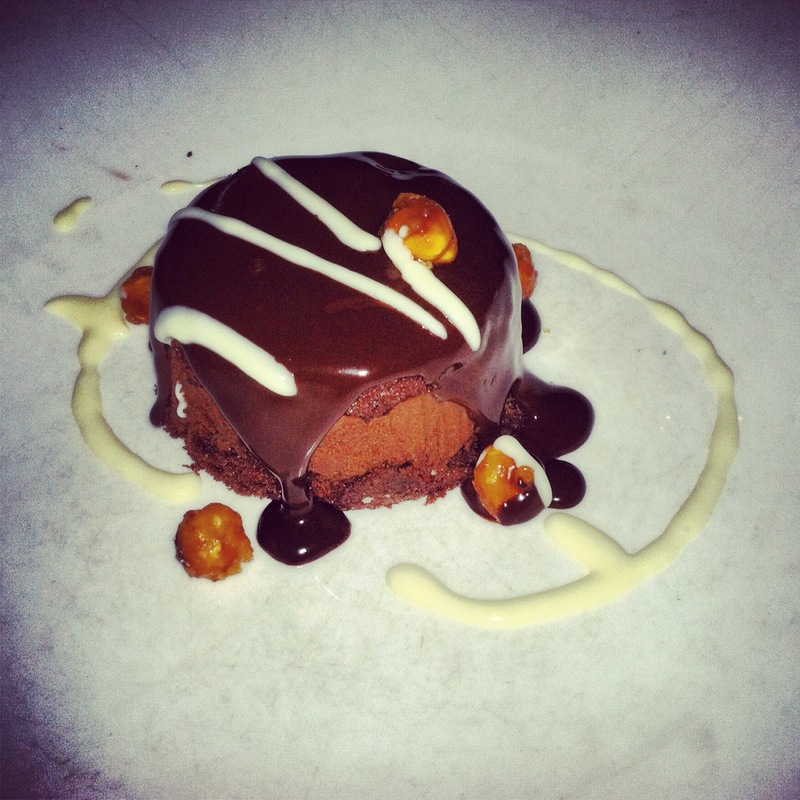 This chocolate hazelnut cake was topped with chocolate sauce and caramelized hazelnuts. Once I cut into it I saw that it was layered: cake, mousse, cake, mousse. It was moist, decadent, and chocolately! 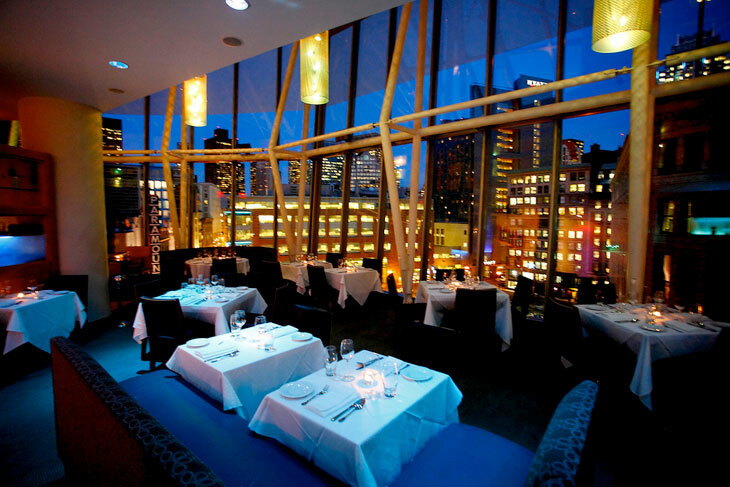 Service: We were originally seated at a table outside with a beautiful view of the Charles River. It was perfect for the 15 minutes we were out there, but swarms of tiny bugs soon took over our table so we asked to be moved inside. Not only did the wait staff try to thwart off the gnats with a pan of rosemary oil (apparently that delicious smell is suppose to repel them?! 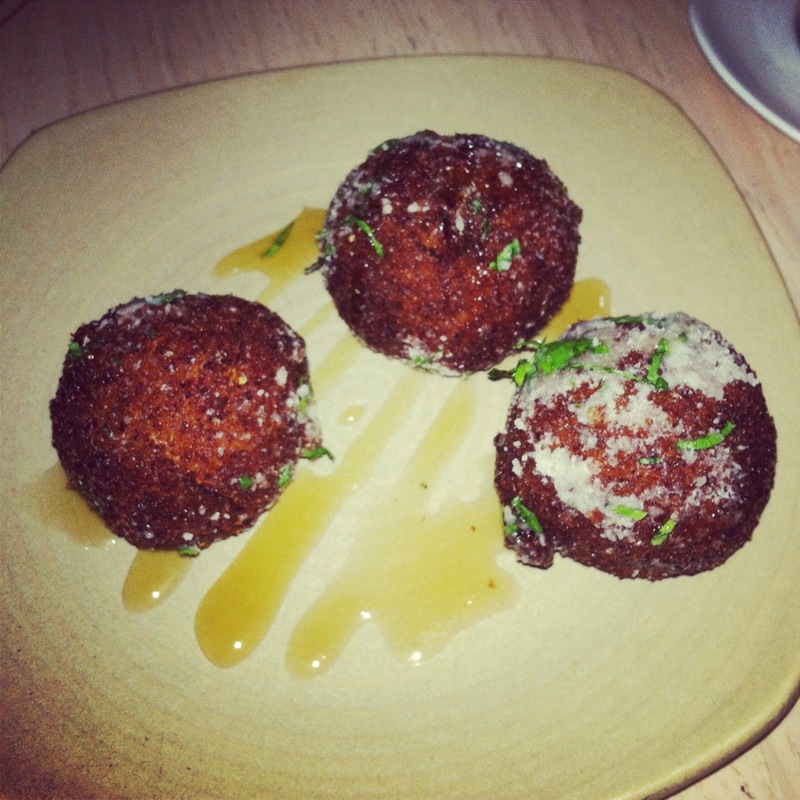 ), but we also received a complimentary Arancini dish once we were seated indoors. The bugs were by no means the fault of the restaurant but they made it a point to give us a little something extra for the trouble. Overall: We had a fun night surrounded by good friends, great wine, and a nice dim & relaxed atmosphere, but overall I think we were a bit disappointed with the food. 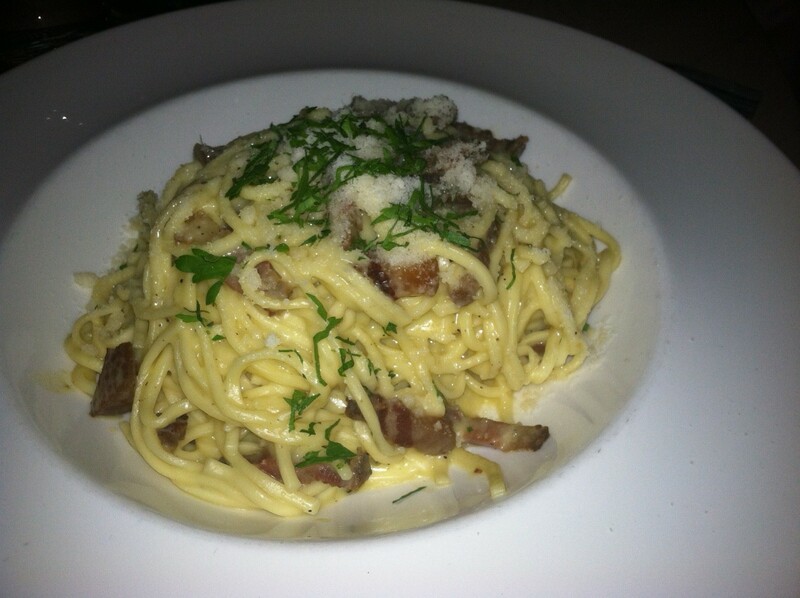 The 2 true Italian dishes I tried (Arancini and my friend’s Chitarra Carbonara entrée) were really excellent. I’m glad I tried the pork, which was good minus the salty pig product, but if and when I return to dante I’ll probably stick to the pastas! The Perfect Bite: Arancini drizzled with truffle honey. For more photos & descriptions of what everyone in my party ate, visit my Facebook Page http://www.facebook.com/ThePerfectBiteBoston or find me on Twitter and Instagram! 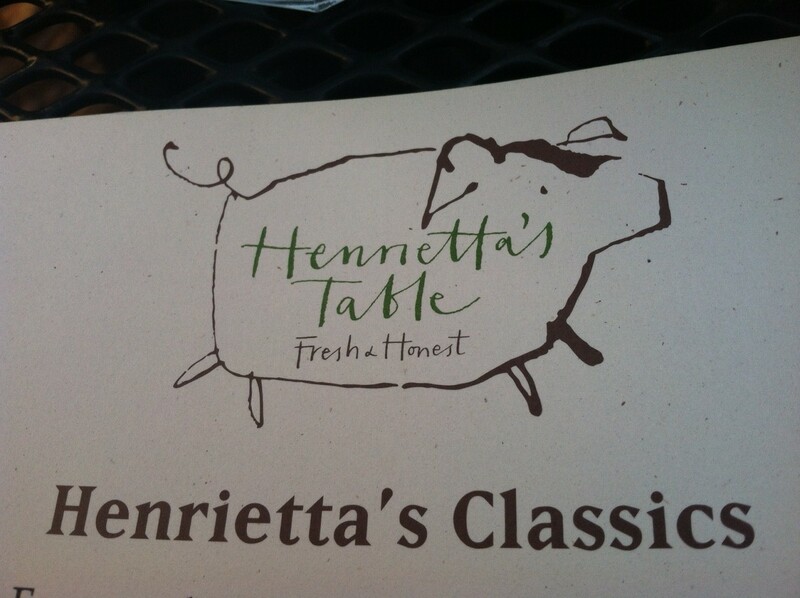 My second of five RW dinners was last night at Henrietta’s Table in the Charles Hotel in Harvard Square. 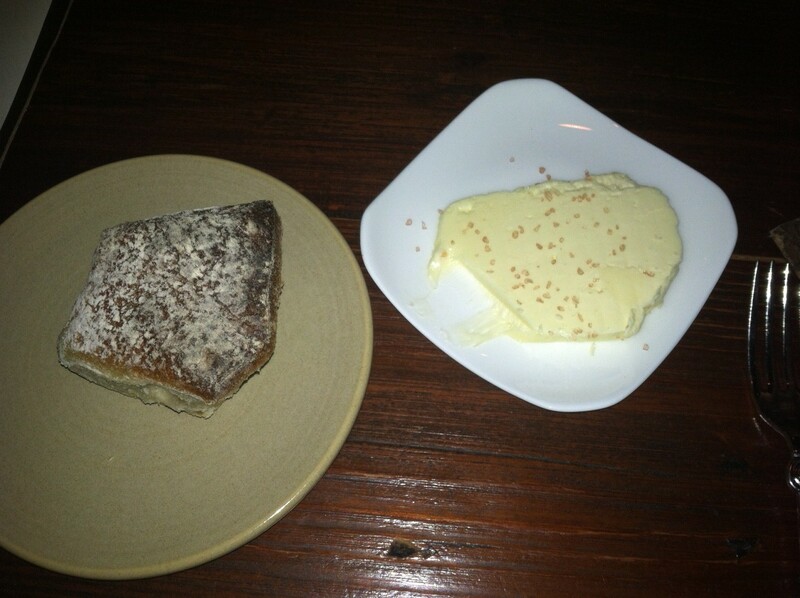 Bread: Three types of bread were served with a circle of butter, 2 of which were dry but the cranberry walnut slices were excellent. 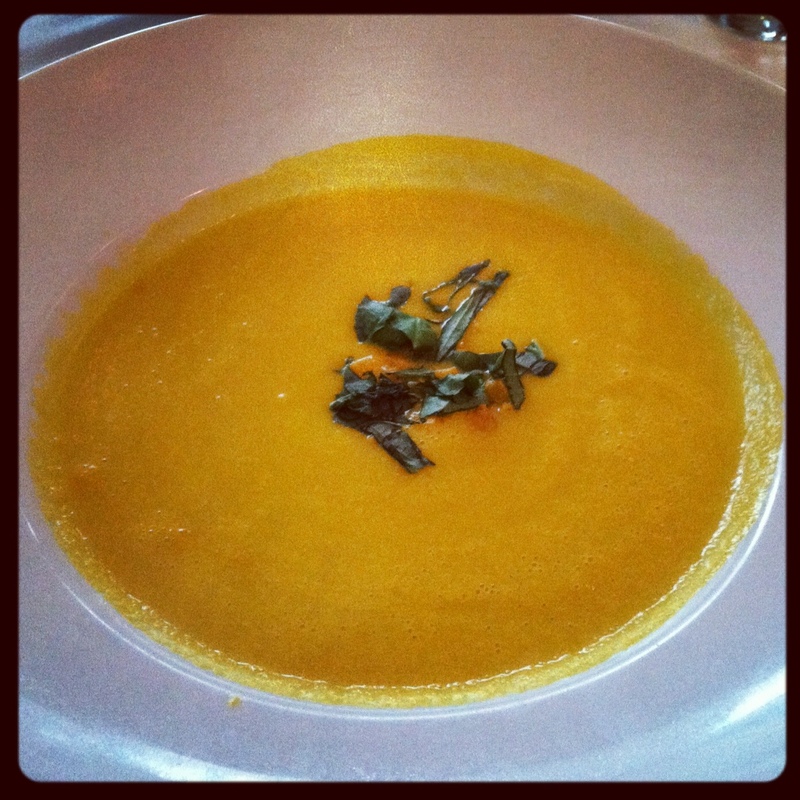 It was between this Special Starter and another special, Tomato & Summer Vegetable Soup. 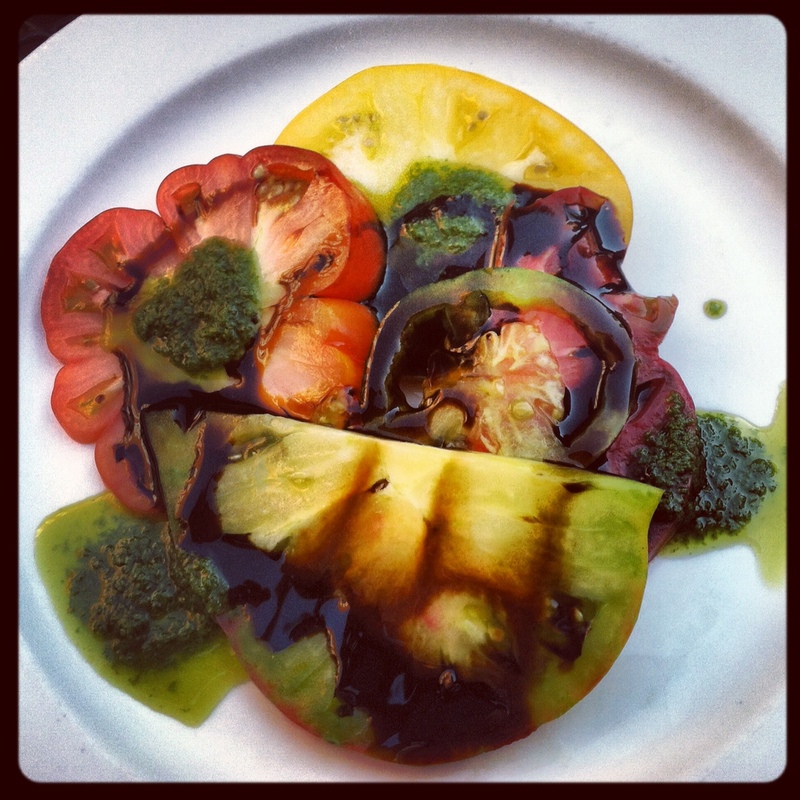 I love tomatoes and as summer is inevitably winding down I decided to take advantage while this fruit is still in season and you can eat it fresh & raw. A light and tasty way to start the meal! 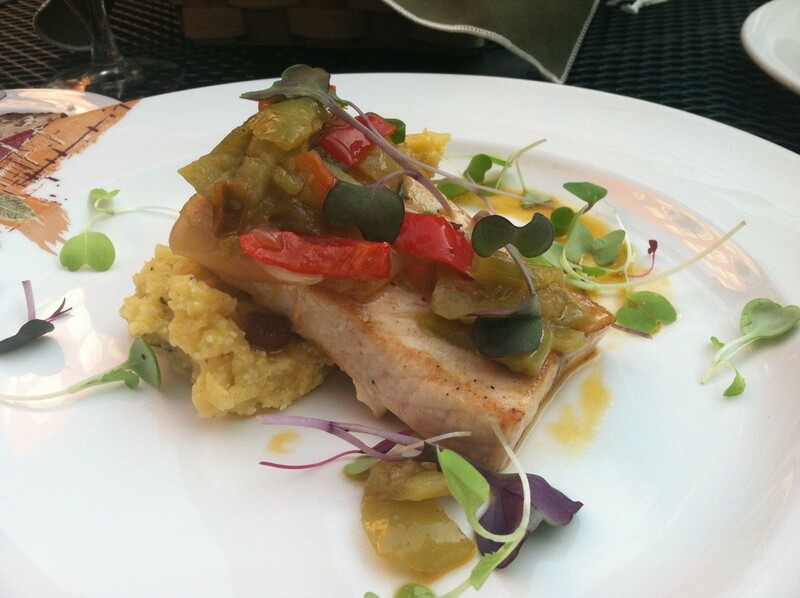 A small rectangular piece of swordfish was served over the herbed polenta and topped with sautéed peppers & onions. Before ordering I asked our server how the polenta was prepared (I prefer a creamy polenta over a polenta cake) and she described it perfectly as being stiff enough to hold up the fish but still soft enough to have that gritty texture. 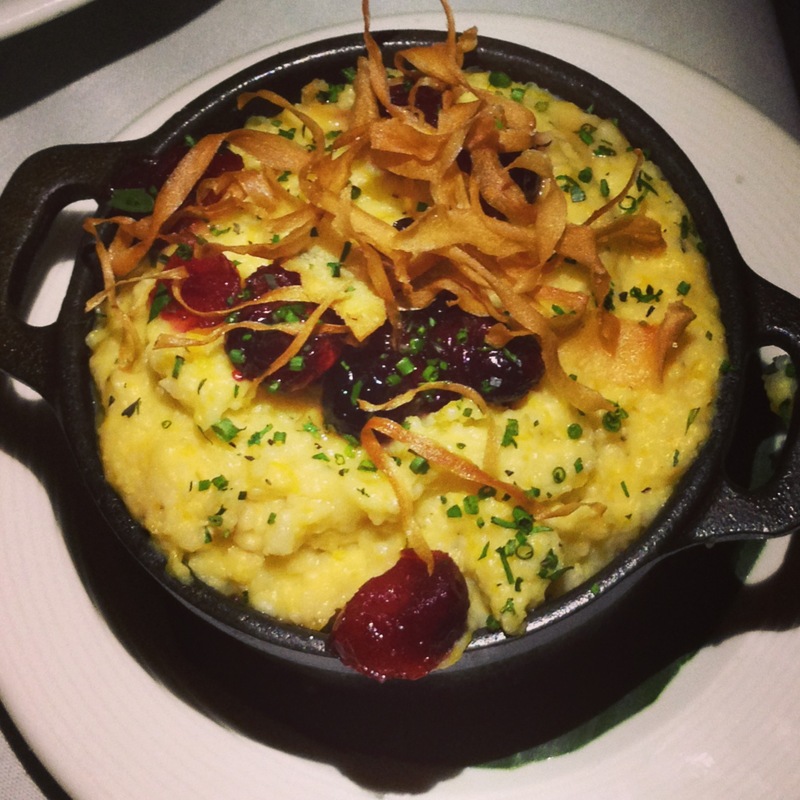 It was really excellent, a different preparation of polenta that I’ve never had and truly enjoyed. I was really intrigued by the Warm Blueberry Upside Down Cake but earlier in the evening I saw the S’mores Skillet walking by and just couldn’t resist! 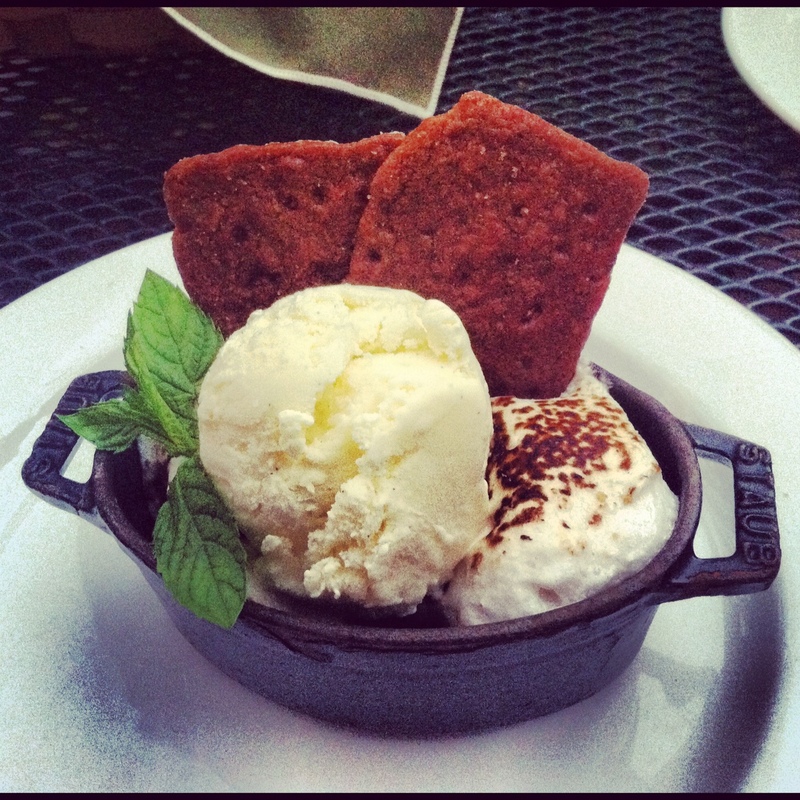 Served in a warm cast iron skillet with a mound of melting chocolate, toasted marshmallow, 2 cinnamon graham crackers, and scoop of vanilla ice cream, this dessert was heaven. My only issue is that after devouring evening you see in the photo I was left with a large piece of chocolate that didn’t quite melt; some may see this as a perk but I’m not a fan of just a plain chunk of chocolate. Service: This service on this particular evening was a little spotty; I had to ask for bread which I hate doing, it took quite a while for our waitress to even approach our table, and the courses were served rather swiftly, which I don’t mind but I felt like we were being rushed at times. 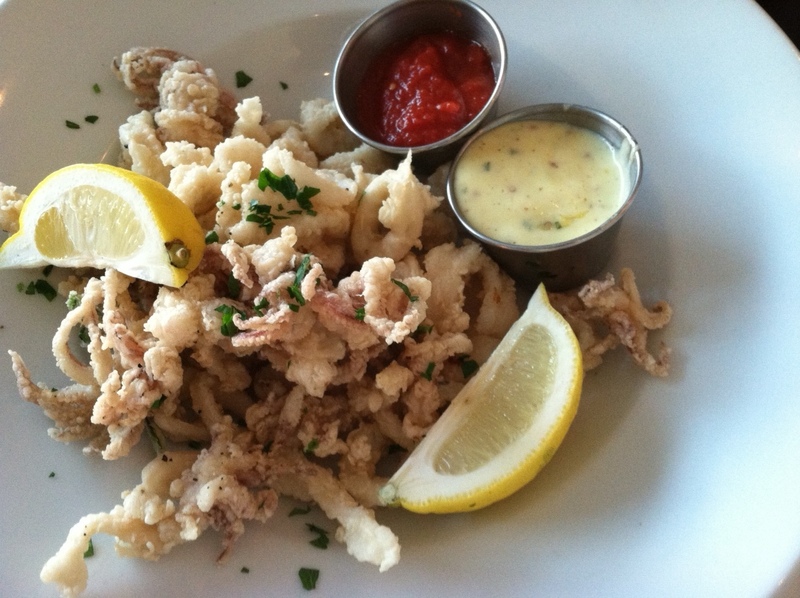 Overall: Henrietta’s Table is a great spot to try for Restaurant Week as it offers its full menu and then some. 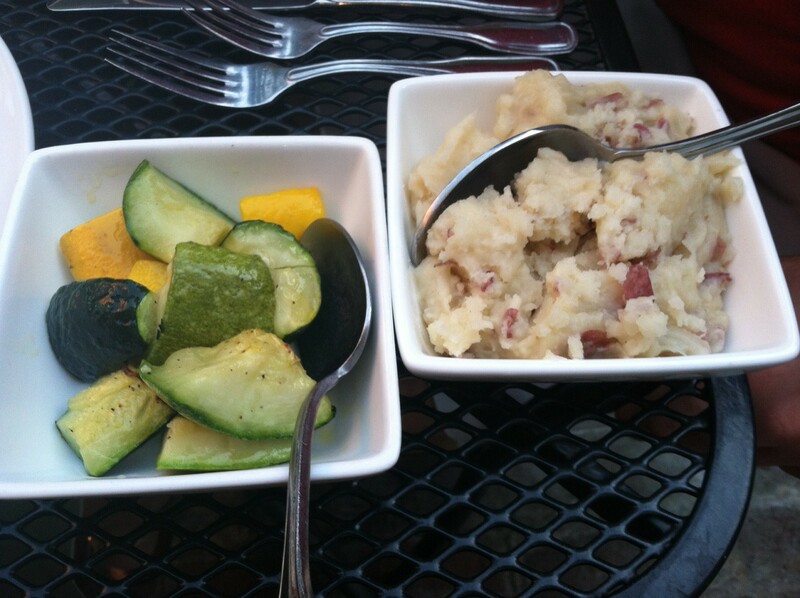 Along with our 3 courses we were also able to choose a side dish; I went with the Spicy Squash & Zucchini while Matt had the Mashed Potatoes – both were excellent. 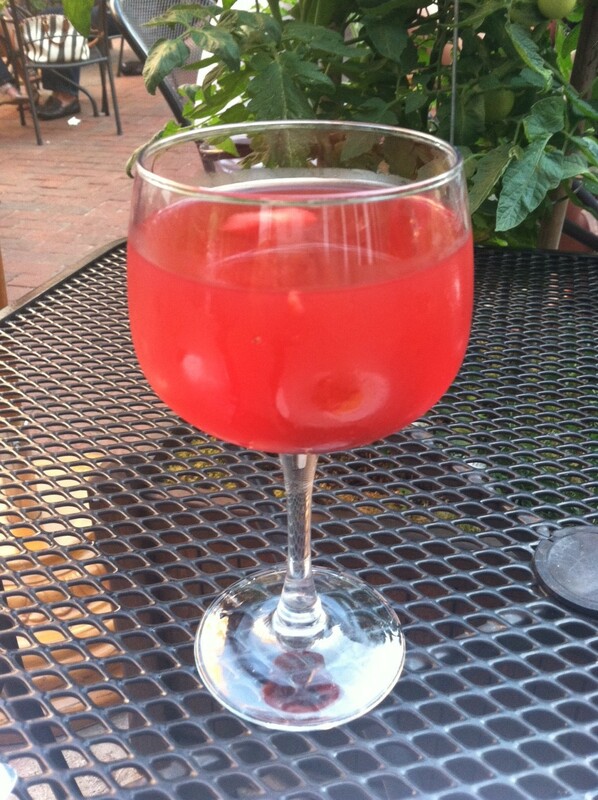 The sangria however (consisting of Pinot Grigio, Bacardi Rum, Creme de Cassis, sparkling wine, cranberry juice, fresh squeezed orange juice, sugar, mixed berries) tasted like a fruity alcoholic drink gone wrong – way too sweet, extremely disappointing. We sat outside on their patio (on a perfect summer evening) so I didn’t fully experience the dining room. We did walk through the restaurant and it’s quite casual, you almost feel as though you’re having dinner at someone’s kitchen table. A relaxed and rustic setting for a low-key date night or a family dinner. The Perfect Bite: Graham cracker dipped in melted chocolate with a scoop of toasted marshmallow. 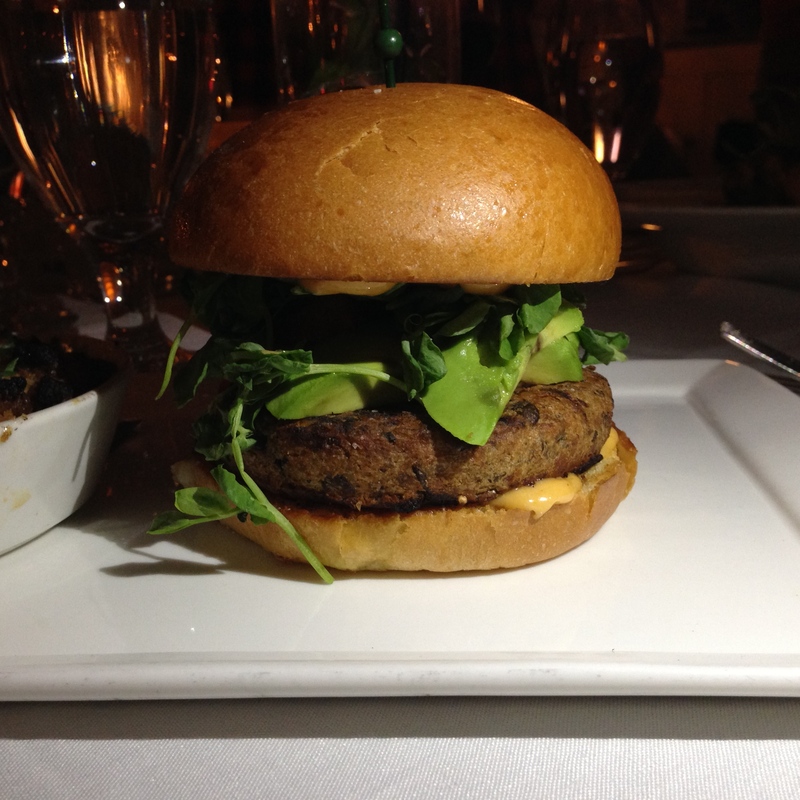 My first of 4 RW dinners was last night at Bambara in Hotel Marlowe in Cambridge. 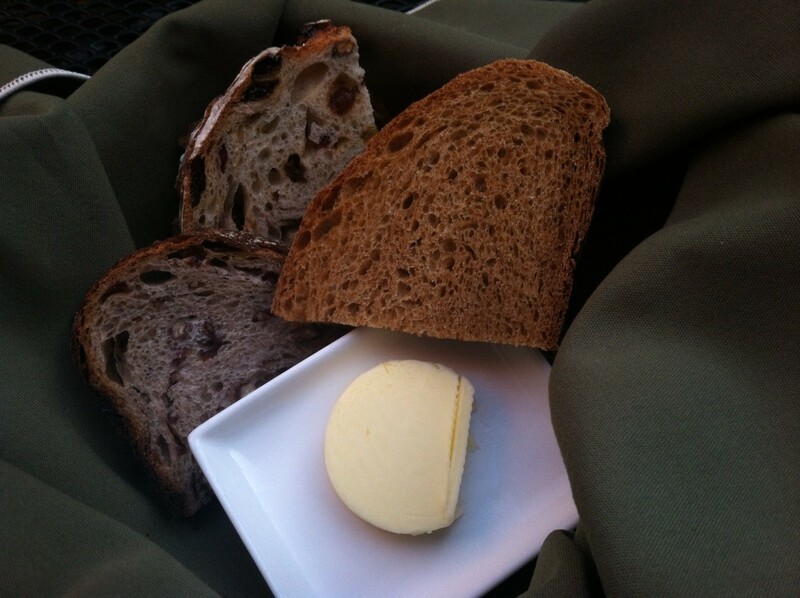 Bread: Four rustic rolls were served with softened salted butter. The couple we dined with arrived before us and received the bread before we sat; my roll was a little hard and not warm, but perhaps it was when it was served? It was still good and I of course ate the entire thing. 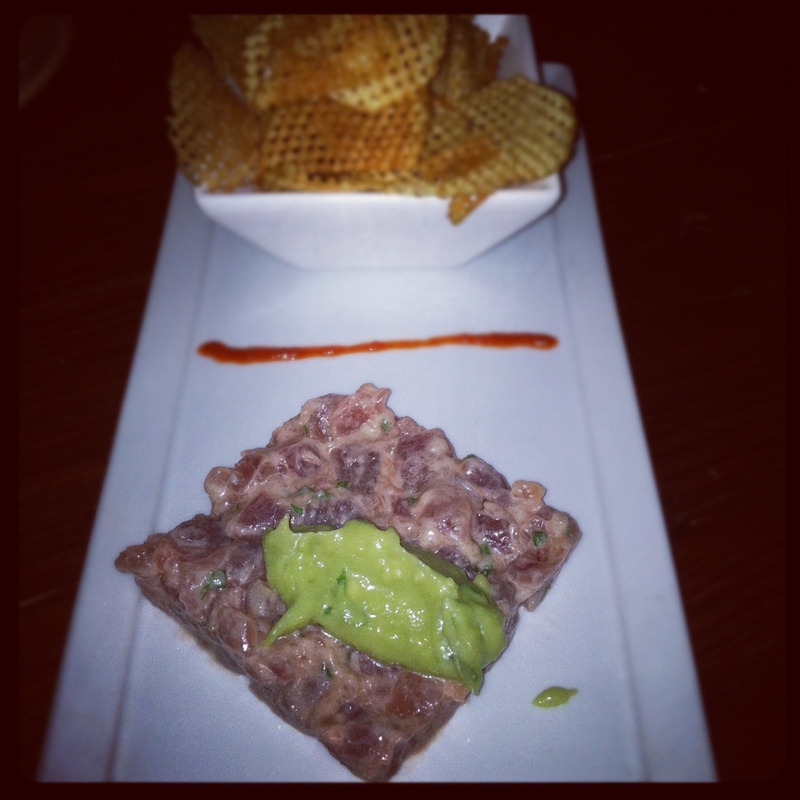 A square of tuna came topped with a dollop of avocado puree and a bowl full of salty waffle chips. The “spicy” component came from the sliver of red (maybe sriracha) sauce in the center. The chips were unfortunately too thin to pick up the tuna on their own and kept breaking! Otherwise this was a great start to the meal. This dish was so scrumptious! The “crispy polenta” was actually warm and soft underneath all of the vegetables, almost like a potato cake. The corn was crisp and fresh, and leeks were so flavorful, and the sauce has a great consistency without being too creamy. Great veggie entrée! This was not your typical bread pudding. I was initially slightly disappointed at the sight of it, but after one bite I immediately changed my mind. 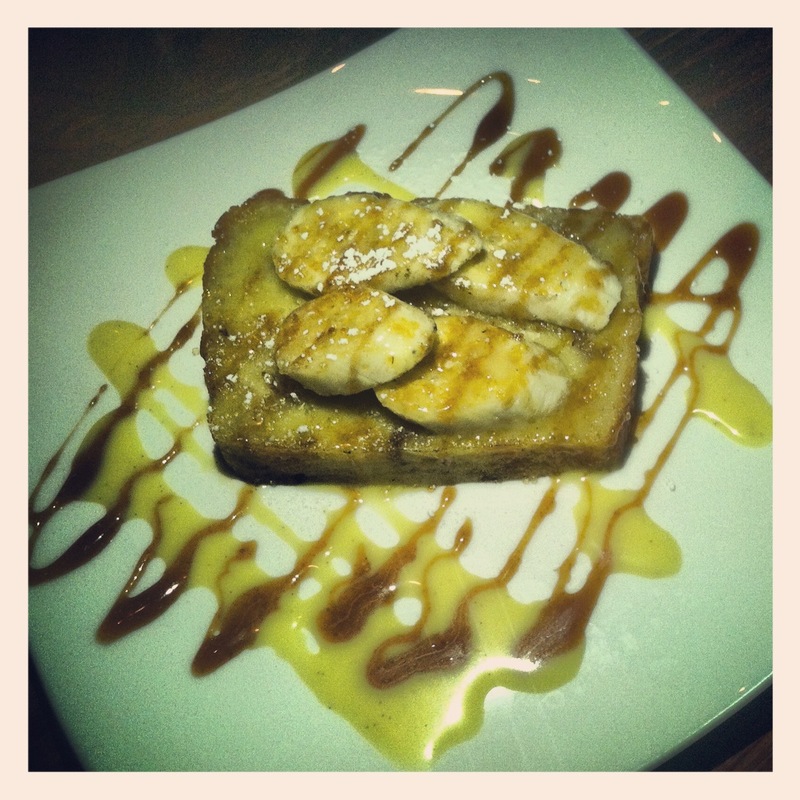 The dessert was more of a pound cake/banana bread type, topped with sugary banana slices and drizzled with caramel. I wouldn’t call it bread pudding, but whatever it was, it was delicious. 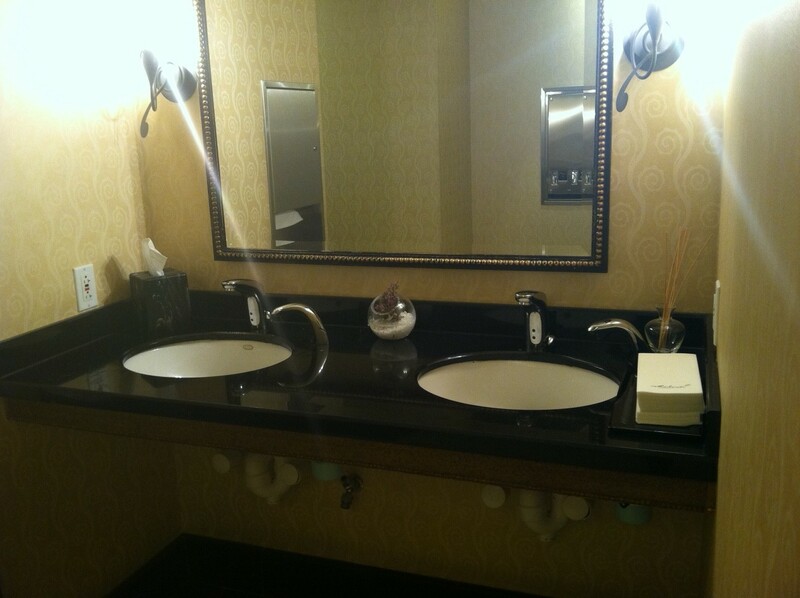 Bathroom: This restroom wasn’t part of Bambara, as the restaurant is in the Hotel Marlowe in Cambridge. 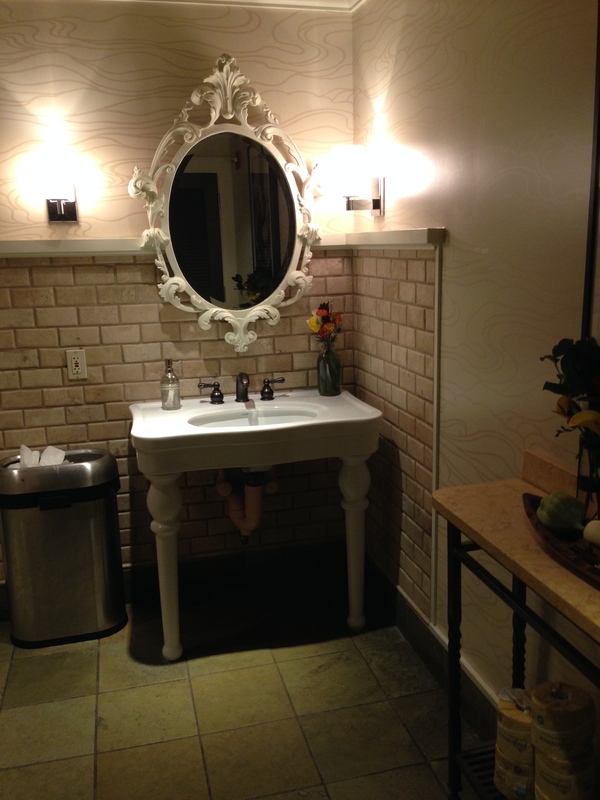 The restroom is in the hotel’s lobby and therefore did not reflect the character or style of Bambara. 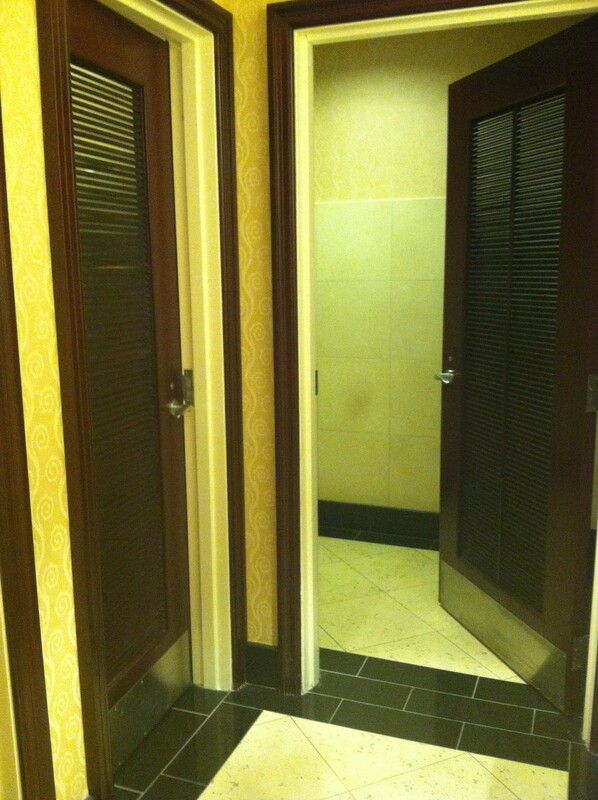 However I did love the shutter stall doors and automatic soap dispenser and sinks. Service: Our server was present when he needed to be and helped my friend choose the Salmon which was the “Catch of the Week” over the Pan Roasted Cod. Our water glasses were filled regularly and he checked on us throughout the meal. 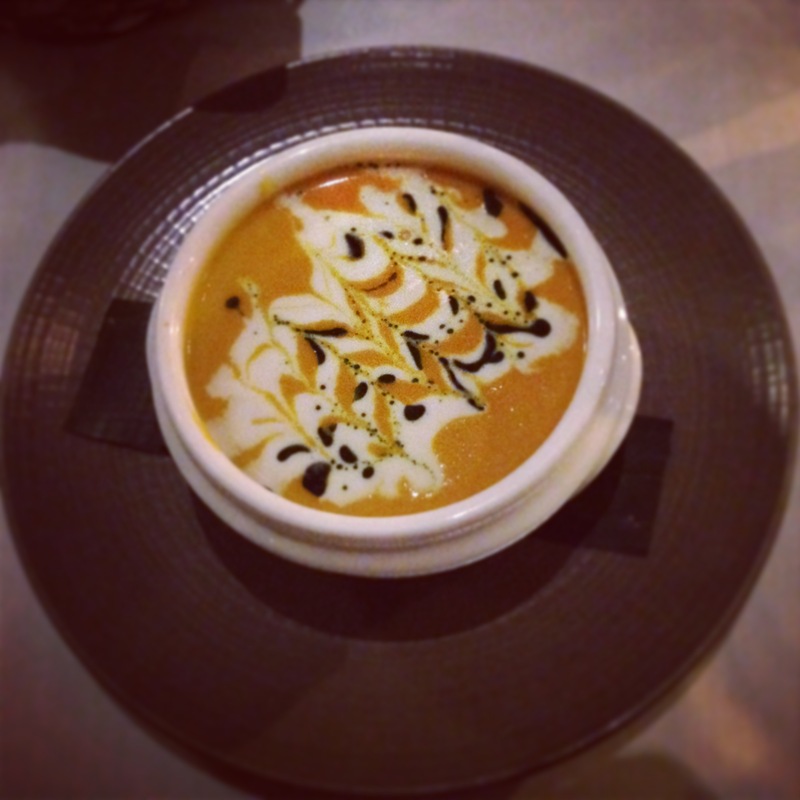 Overall: Restaurant Week wise, I recommend Bambara based on the wide variety of options and excellent quality of food. The portions were appropriate for a 3-course meal; some may say the desserts were small but after a full app & entrée I was delighted by the medium slice of banana “bread pudding” and multiple-bite sized Caramel Date Cake. Another plus, we parked in the Cambridge Side Galleria for $3.99! You won’t find that pricing in a Boston lot/garage. 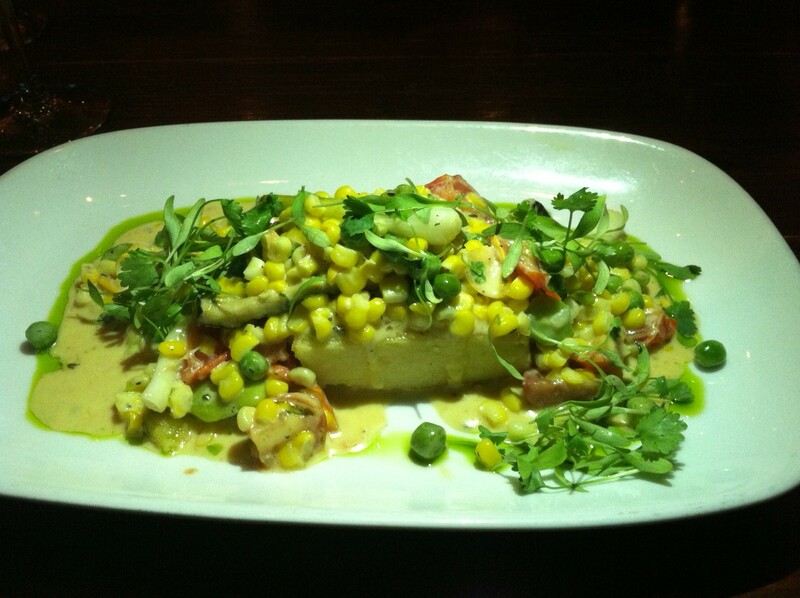 The Perfect Bite: Soft polenta, crisp corn, baby leek… and any other veggie I can fit on the fork! 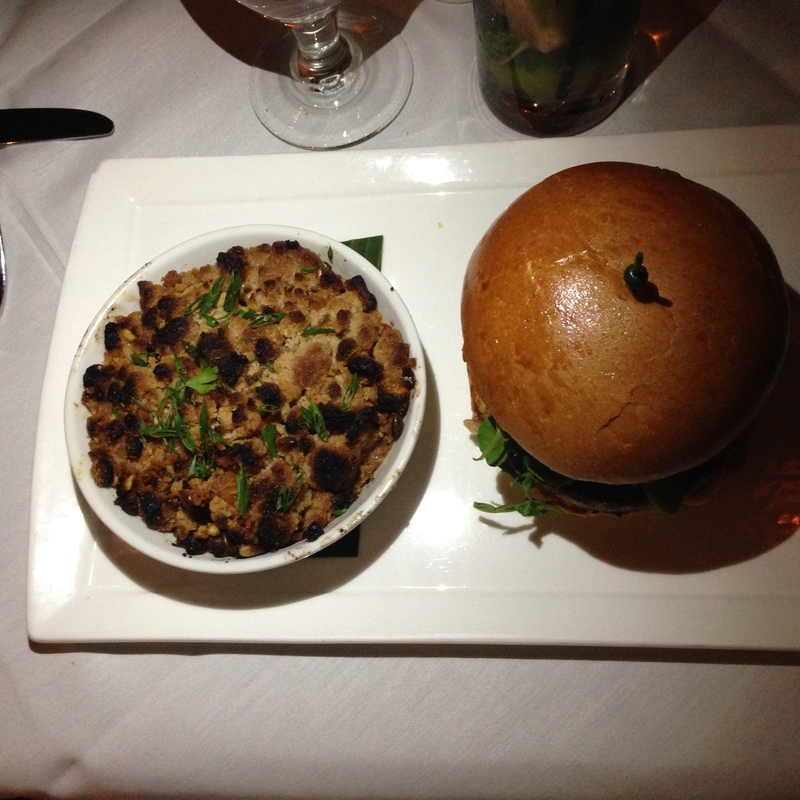 Before this dinner Savored sponsored dinner (which granted us 40% off our food bill) I had never heard of Blu Boston. Located above the Ritz-Carlton I figured it was out of my league in terms of clientele and price, but it was neither stuffy nor pretentious (not implying that the Ritz is either of these things). 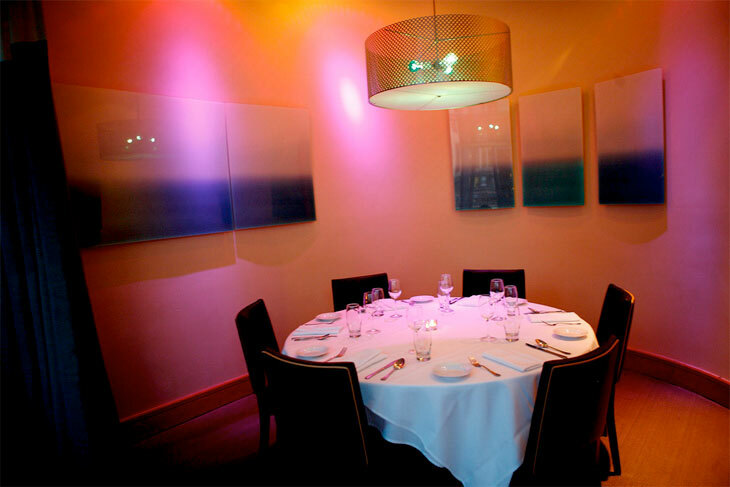 It has a hip & trendy vibe with moderate prices and contemporary American menu. Bread: As there were 6 of us, two baskets of herbed focaccia bread were brought to the table with a side of dipping EVOO in a pretty teardrop dish. These tiny bites were excellent, there’s no way you could have just one! Menu: The dinner menu offered Appetizers, Salads, and Entrees. Nothing too exciting but each section had plenty of mouth-watering options. I knew I wanted the Summer Squash Soup, and there were quite a few entrees that looked appetizing but since we ordered 3 apps for the table I ended up with a soup and salad. 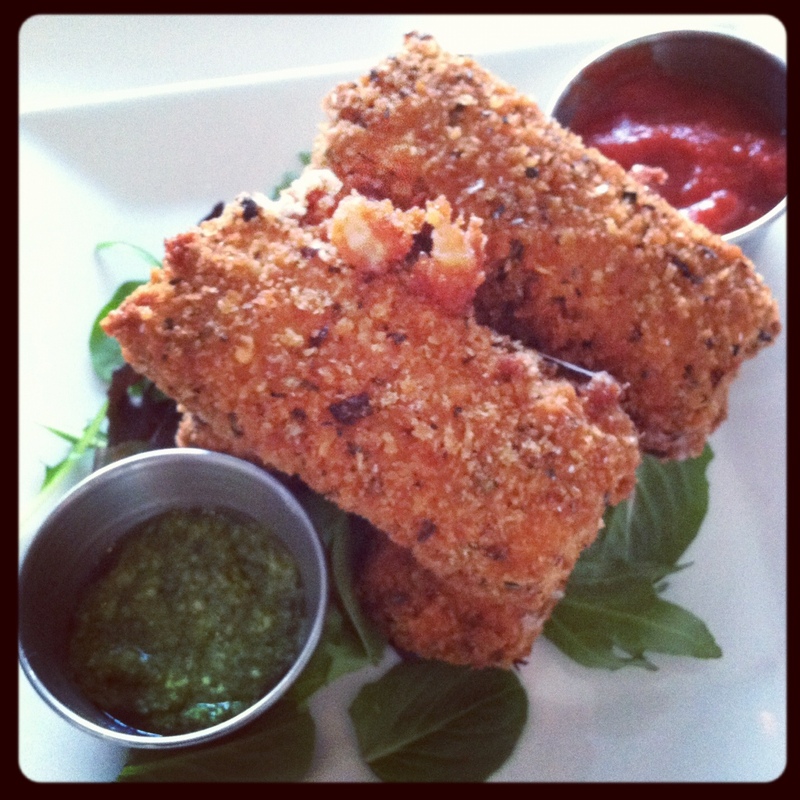 Four short logs of smoked mozzarella were stacked on top of each other with a side of pesto and marinara for dipping. I of course favored the pesto sauce which in my opinion goes well with anything. The thick sticks did have a noticeable smoky flavor which I’ve never seen before in this classic app. 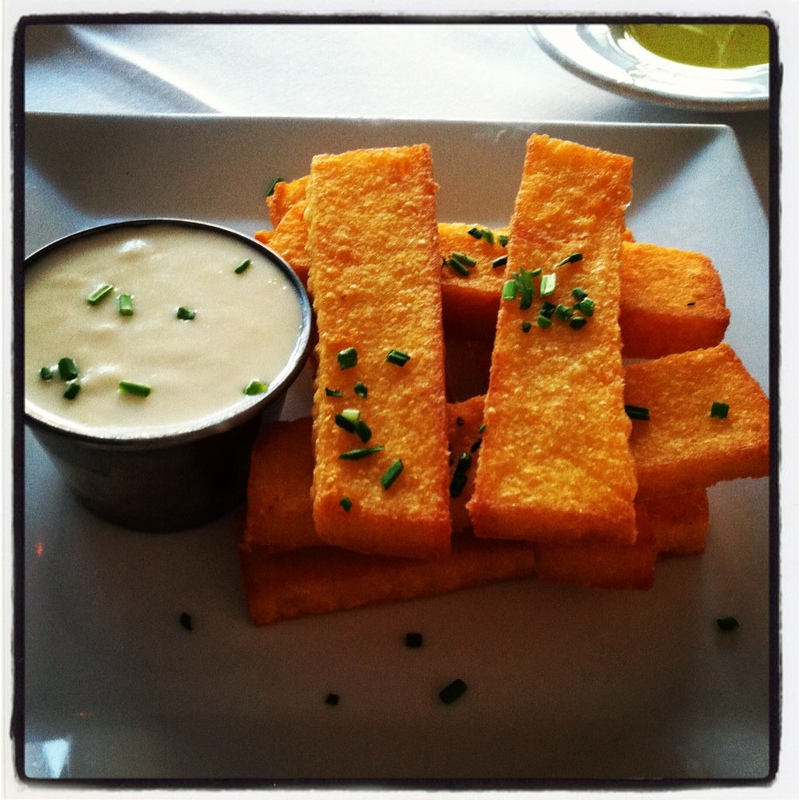 Eight polenta fries came balanced like Jenga pieces, topped with chives and accompanied by a side creamy dipping sauce. The outside had a slight crisp while the inside was warm and smooth. These were really excellent, and clearly everyone’s favorite app. 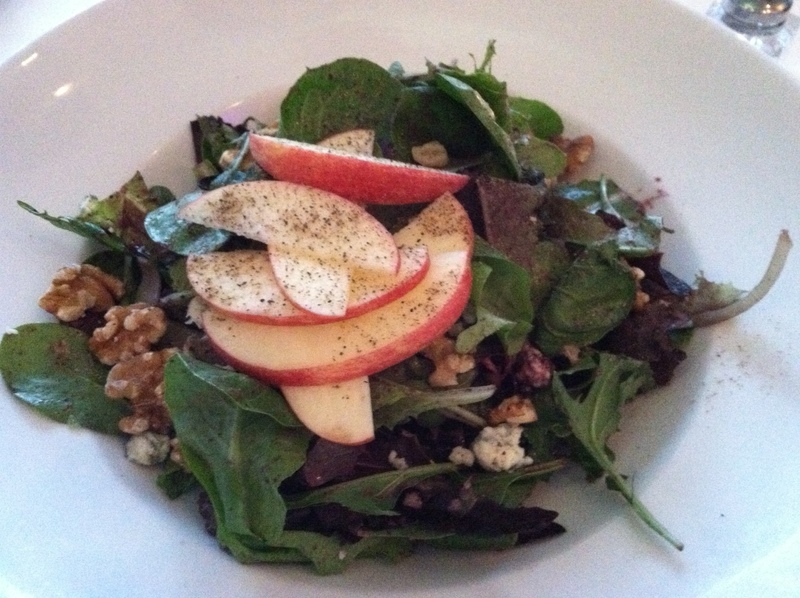 I typically skip by the “Mixed Greens” salads but this one actually caught my eye, mainly with the blueberry vinaigrette. It’s a common salad, one that I’ve even made for myself, but it never disappoints! It was lightly dressed and had a perfect amount of each component. Winner! 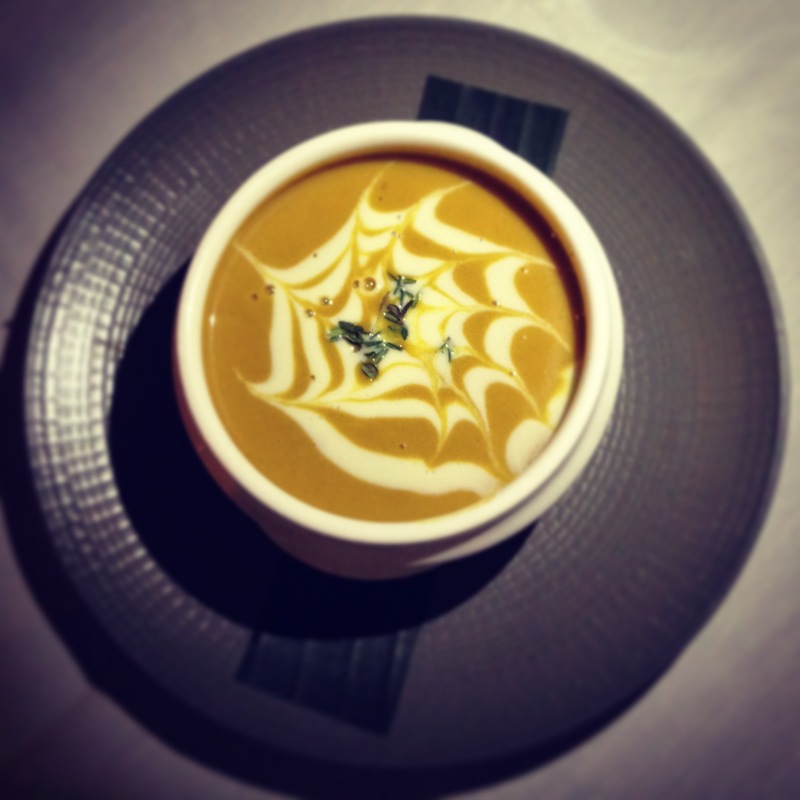 This soup was unlike anything I’ve ever tasted, and not necessarily in a good (or bad) way. I’ve seen pureed soup that is quite liquidy, some with a thicker consistency, others with chunks of veggies, but this was light as foam. It essentially dissolved as soon as I put the spoon in my mouth. It had some flavor but there was zero texture and tasted like air. A little strange. 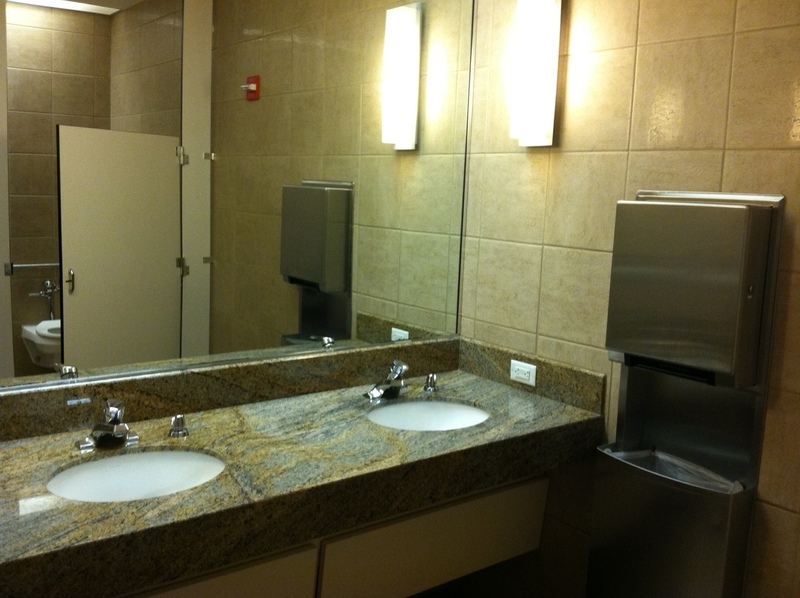 Bathroom: I can’t accurately judge, as this bathroom also belongs to The Sports Club/LA, but it was clean which is important …certainly nothing special though. Service: Twice in a row now the bread has come before we ordered (see Stephie’s on Tremont)! It didn’t influence our decision making however as we still ordered 3 apps. We didn’t interact too much with our server but our water glasses were filled and each course came out in a timely manner. Overall: The food was great and the space is really pretty. Floor to ceiling windows line an entire wall providing views of Boston and the surrounding buildings in the Ladder District. The dining room has mainly free standing tables with some banquettes and small alcoves for semi-private dining (which is where we were seated). For being located above the Ritz and within The Sport Club/LA I expected the prices to be more outrageous, but entrees were mainly in the $20 with a few reaching the mid-$30s. 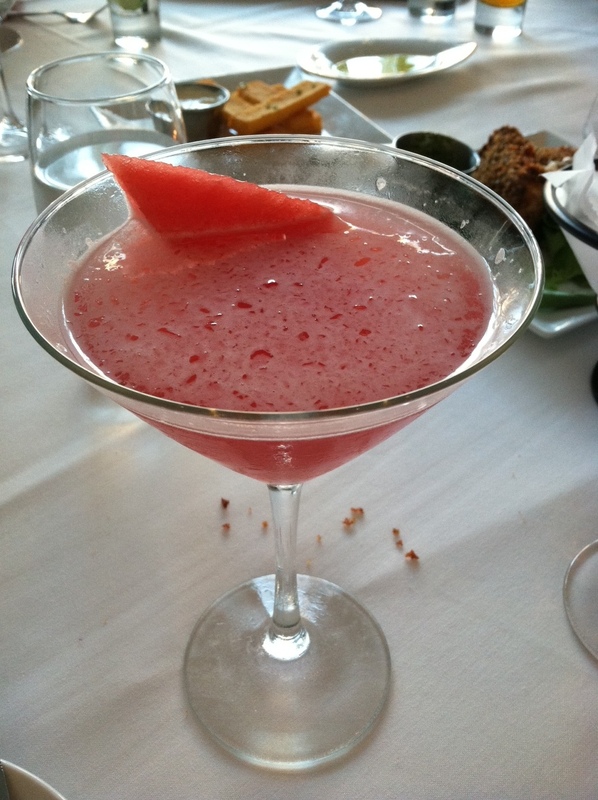 I only tried one cocktail but their Watermelon Martini was excellent! The Perfect Bite: Polenta Fries dipped in the basil pesto from the mozzarella sticks.